Our dentists will stop at nothing to ensure a world class dental experience. We are motivated by your smile goals. You expect communication and respect from your dentist. Casper, WY, patients can find that kind of openness at Aspen Ridge Dental. Patients can trust us to take care of them, and make them feel like our own family. Your family deserves judgment-free, comprehensive care from your dentist. 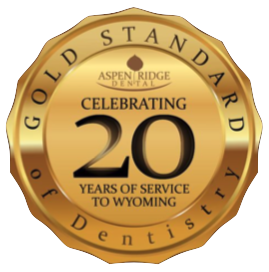 Casper, WY, residents can come to Aspen Ridge Dental for a variety of services delivered by skilled professionals. Dr. Stuart Youmans completed a one year general practice in Omaha with a special emphasis in oral and maxillofacial surgery and trauma. He is a part of your family and your community, providing dental care to handicapped children and adults at the Casper Surgical Center and Wyoming Medical Center. With Dr. Youmans’ unique skill set and the amazing talent of his team, we are confident that we can provide you with a successful dental experience. Cosmetic dentistry empowers you to create the smile you have always wanted. We would be happy to sit down with you to discuss your concerns and determine which cosmetic transformation treatments might be right for you. Patients with missing teeth need a qualified dental implants dentist. Casper, WY, residents will be pleased to find that Dr. Stuart has implant Diplomate status. As the only American Board of Oral Implantology diplomate in Wyoming, he sets himself apart in providing an excellent dental implants procedure. Orthodontics is a healthy and conservative solution to improve your smile. Orthodontics not only cosmetically align the teeth and create a beautiful smile, but they also improve the overall bite and protect the teeth long-term. If fear of pain or discomfort is keeping you out of your dentist’s office, ask our caring Casper professionals about sedation dentistry. We want to help you achieve the smile of your dreams with dental work that is pain-free and stress-free. Sedation dentistry makes an ideal procedure totally possible. We practice quality family dentistry in a warm, comfortable atmosphere. We strive to not only to be your dentists, but also friends to you and your loved ones. We provide every family dentistry service you and your family might need, from bonding to root canal therapy. We invite you to join us at Aspen Ridge Dental for every aspect of your dental care here in Casper WY. Contact our office today to learn more about protecting and improving your oral health.